"constructive feedback" is good. "Ridicule" is unacceptable. 3) Be prepared to learn. Bring your materials to class every day. That includes an active mind ready to soak up new knowledge. Appropriate = when others are not talking and when your comments/questions will contribute to the current discussion of the class. 5) Avoid distractions to you and others. If we follow non-negotiable rules 1-4, this should not be an issue. I've tried to make grading as simple as possible. If you do work to a high standard, and turn it in on time, you will get an A. Below, I have broken down grading into three categories of assignments: small assignments, notebook checks, and projects on your digital portfolio. The majority of the work you do in this class will fall into this category, because every project, no matter how big, breaks down into a series of small tasks. So you understand how this works, I've created the handy flow chart you see below. Please take special note of what it says at the bottom of the chart: if you believe a grade was incorrectly entered into Powerschool, send Dr. P an email about this within two weeks of when it was entered! From time to time, I will collect a class's Write Club notebooks. The total point value of a notebook check will be based on the number of assignments that week, with two points given per assignment. So, in a week with six assignments, a notebook check will be worth twelve points. I will count the week's assignments based on what is written under "What we did today". The same rules for late work and work of unacceptable quality apply to notebook checks as to 10 point assignments. At the end of every project, you will create a page documenting your process on your Digital Portfolio (you can see an example of the assignment sheet here, and an example of a student's digital portfolio here). This assignment is scored based on a rubric (you can see an example here). 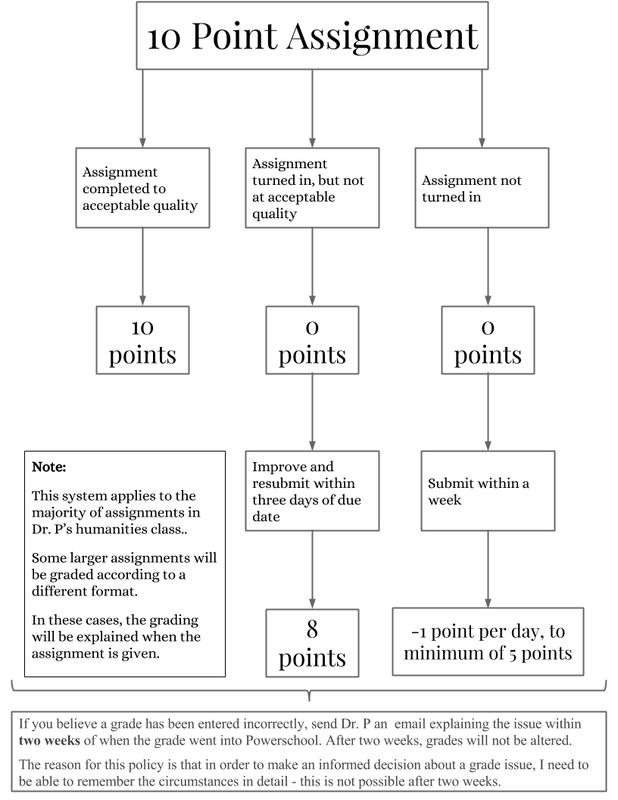 The same rules for late work and work of unacceptable quality apply to these assignments as to 10 point assignments. Cell phones can be great tools for research. If you have an academic reason to use yours during class, ask permission from your teacher to take it out. However, if you have a cell phone out without permission, it will be taken away for the rest of the day. You will have the number of days you missed to make up the missing work (so if you were out for three days, you need to have all your work finished within three days of when you return to school. To see what work you have missed, visit the What Happened Today blog. 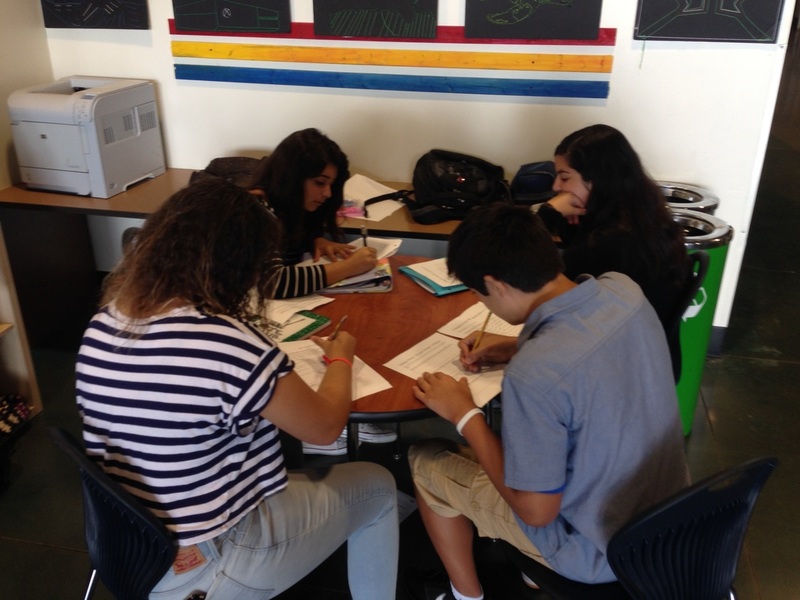 Your Write Club notebook should be up-to-date whether you are in class or not. If there is a writing assignment you can't do because you weren't in class, write a note in your notebook explaining this, so I know what happened when I check it. You will need to schedule a meeting with Dr. Patton to work out an alternative assignment. If you miss a test or quiz because of absence, you are responsible for making it up in a timely fashion. When you return to school, talk to your teacher about when you can do this. If you use somebody else's words or ideas (even if you put those ideas in your own words), and you don't give that person credit by including a citation, it is considered plagiarism. Written work which uses somebody else's words or ideas without giving that person credit will receive a zero and be referred to the Dean. Purdue University has created a useful resource for avoiding plagiarism, which you can find here.